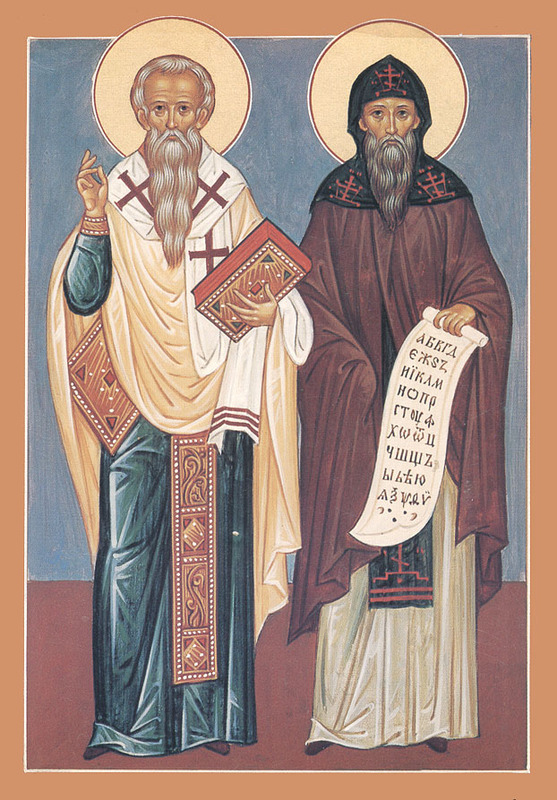 The saint brothers Cyril and Methodius were the teachers of Slavs. Their father, Leo, held the position of the assistant to a military leader in Thessalonica, the place he was coming from. According to some references their father Leo was Slav and their mother was Greek. Long before the birth of the saint brothers that city was surrounded by the Slavic tribes which were unsuccessfully trying to conquer it. The proximity of the neighboring Greek and Slavic tribes influenced one another. And it was natural that both brothers had a good command of Slavonic language since their childhood, especially because their father was Slav. At that time (the beginning of the ninth century) the iconoclasts were still influential in Byzantium and were the heads of the Episcopal department in Solun. Not fearing to lose his position, Leo and his family stayed pious and practiced true faith in their every day life. Since early years the youngest son Constantine (born 827) was remarkably different from other children in the family. He amazed everyone by his abilities of remembering things and exceeded in his studies. He was working on the books of Gregory Bogoslov particularly diligently but could not comprehend everything. The young adolescent was praying patiently for enlighten. In 842 after his father’s death 15 year-old Constantine was invited to Tsar Grad as a coeval to a young six year old emperor Michael for rendering good influence on him. In the capital Constantine enabled to make a progress in science which he was longing for. At that time an educated monk from Sicily St Methodius was a patriarch there who suffered for Orthodoxy and was considered a confessor. At the imperial’s court he established a school to improve education there. Constantine was learning from the famous scientists among those was Leo the Philosopher, earlier known as metropolitan of Solun, and future patriarch Photius. Constantine was driven closer especially to the latter whose influence made a big impact on the further life of the saint. Constantine was appointed a librarian in St Sophia which was opening the bright opportunity at the imperial’s court and the possibility of a marriage to a high official’s daughter. But he was indifferent to anything. After he had been ordained in 850 he left Tsar Grad and secluded himself in a monastery on Marmora Sea. Shortly after that he was summoned to return to the capital where he was appointed a teacher of philosophy in the imperial’s school. On the will of Cesar Vardan he dissented from patriarch Iconoclast John Grammatika’s views who thought of himself as an undefeated opponent during the debates. But Constantine was a winner that time. Around 851 Constantine the Philosopher was sent to Sarazins (also known as Khazars who embraced Judaism) to conduct new debates with local wise men in Baghdad. They were mostly interested in the questions of the Holy Trinity and the incarnation of Jesus Christ from Holy Virgin Mary. After Constantine had successfully won those debates with Sarazins there was an attempt of poisoning him but God kept him save. That mission helped to broaden his knowledge in studying religion, languages (especially Arabic) which had become a good preparation for his main apostolic mission in future. Methodius was the oldest of Leo’s sons. His moral standards were similar to his younger brother Constantine. He was an attractive man and the tsar was also aware of his worthy and appointed him as prince in Strumsk region in Macedonia. However he realized the vanity of life after 10 years of his service there and decided to seek higher satisfaction in the tranquility of a monk cell. He secluded himself in the mountain of Olympus. A famous ascetic Theodore Studit was laboring in one of the monasteries for a while there. Methodius devoted himself to the prayer and to the readings. Later his brother Constantine joined him there. They both broadened their knowledge by living an ascetic life style. They had prepared themselves for their future enlighten mission according to God’s will. While they were in their tenement Khazars had sent a representative to visit emperor Michael. Since the third century that tribe of Ural and Chudskoye Lake’s origin had dwelled on the shores of Caspian Sea near the mouth of Volga River. At that time Khazars were dominating up to Dnepr and went up to Oka River. They were mostly pagans and Muslims, and to a lesser degree were Jews and Christians. In the eighth century Judaism increased and gained its popularity among nobles and "kagans" (princes). Since early times Khazars had friendly relationship with Byzantine and now (in 858) they asked to send them preachers of Byzantine’s religion to compete with Jews and Sarazins. The emperor sent Constantine and Methodius on that mission. On their way to Khazar tribes the saint brothers had spent half of the year in Greek Crimea, known as Kherson (Korsun) at that time. Constantine learned Hebrew thoroughly and could read Samarian books. He found New Testament and Psalms written in Russian characters. The saint brothers discovered holy relics of St Clement, the Pope of Rome (the 3d bishop of Rome who was exiled to work in the quarries of Incerman (at the north of the Black sea) and was drawned in the sea 100 AC). In Khazar land the saint brothers demonstrated the triumph of Christianity and baptized 200 people. Their mission had continued for 3 years. Constantine stayed at the church of St Apostles after the return to Tsar-Grad (Constaniple). Methodius declined an offered title of a bishop and became a hegumen of Polihronyev monastery. Photius was a patriarch during their Khazar mission. In the end of 862 prince of Moravia Rostislav sent his people to the emperor Michael III. The prince was worrying about his people who were not explained the meaning of the true faith in an understandable language despite the acceptance of Christianity and wished for a teacher who could instruct the Moravians in the Slavonic tongue. The saint brothers were picked by the emperor and patriarch Photius. On the account of their acquaintance with the language, Cyril and Methodius were chosen for that work. During the conversation with the saints emperor Michael noticed their excellent skills in Slavonic language while they were at Thessalonica. Before their departure they had invented Slavonic alphabet. It is thought that the core of Cyirillic-Methodius’ alphabet was a mix of the colloquial speech of Slavs added with Moravian and Macedonian dialects. By that time Moravia was a part of the empire of Karl the Great who was the first to baptize it. According to his will the bishops of Salzburg and Passaut sent missionaries there. However, the services and preaching in German were not easy for people to comprehend. Although prince Rostislav had been crowned by a grandson of Karl the Great, king Ludwig of Germany, but he shared nationalist feelings with his people and opposed the foreign influence. In 855 he declined German support as he was more satisfied with the missionary work received from Byzantium than from catholic west. In spring of 863 the saint brothers arrived in Moravia. Besides an invented alphabet for Moravians they had brought some other translations from New Testament and books for services. They settled down in town Velegrad (Devin) and continued working on translations, introducing Slavonic into holy services, establishing schools and educating people who were joyfully receptive to their teaching. However, the labor of the Greek preachers in a land which was considered by Germans as theirs was viewed with distrust by the German bishop and Pope. Particularly at that time the relationship between Pope Nicolas I and patriarch Photius escalated. The Pope summoned the saint brothers to come to Rome. They started their journey to Rome after 3 years of living in Moravia. On their way to Rome they stayed in Pannonia for awhile. Local Prince Kotsel, a nephew of Rostislav, was learning from them by Slavonic books. Fifty disciples were following the saint brothers to Rome from there in addition to those who were already accompanying them from Moravia. In Venice the saint brothers faced the unfriendly priesthood of the western church. The priests recognized only Greek, Latin and Hebrew as church languages referring to Pilate’s writings made on the Christ’s cross and were used as a prove for that. The saint brothers had to conduct quarrels similar to those they had had once in Moravia. When they arrived in Rome in 867 they did not get to see Pope Nicolas I who had reposed by then. A new pope Adrian II was more soft hearted and received them with the respect as the brothers had brought the relics of St Clemet which were preserved in the church dedicated to the saint name. On the one hand Rome was happy about the achievements in Moravia but on the other they could not approve the introduction of Slavonic language in church services. It is very important to take into consideration general politics of Rome at that time while analyzing the attitude of Pope towards the saint brothers. The changes of views on their mission depended mostly on the relationship between Rome and Byzantium at that time and also on which successor of Karl the Great Pope was supporting. While the saint brothers were staying in Rome, Vasily Macedonian was reigning in Tsar Grad and Photius highly disliked by Rome was replaced by Ignatiy. The later was more loyal to Rome. Meanwhile Bulgarians were leaning towards Byzantine’s religion and there were negotiations in process about that. At the same time Pope was supporting the western Caroling and was seeking Moravian prince’s loyalty who in his turn was opposing the eastern German Carolings. Pope Adrian hosted the saint brothers kindly and the disciples arrived with them were ordained as deacons and priests. Then Methodius also became a bishop. The Pope and his counsel approved the established rules in Slavic lands after listening to Constantine’s explanations. He sanctioned to serve hours and liturgy in Slavonic. Shortly after that Constantine fell ill and he pasted away in 50 days after being dignified with the name of Cyril in February 869. He was festively buried in St Clements’s church in Rome. Methodius was appointed an archbishop of Moravia and Pannonia shortly after his brother’s death and was sent by Pope there. Bulgaria was under Byzantium’s church protection by then. Svyatopolk was a ruler in Moravia and was so friendly with Germans that he had given away his uncle Rostislav to them. It was very important for Pope to get prince of Pannonia and Moravian people on his side. He sent documents (gramoty) permitting to use Slavonic language during the services, however, under the condition that the Gospel would be read first in Latin and then in Slavonic during the liturgy. Methodius settled down in Mosburg at Blatensk Lake and his work was going successfully at first. But soon there was an active opposition led by a bishop of Salzburg who was considering Pannonia under his protection. He ordered to cease Methodius and he was imprisoned in Schwabia in the beginning of 871. He had spent 2 years there. New Pope John VIII (from 872) decided to defend Methodius only because the general politics was changed. He stood up for Methodius proving to a bishop of Saltsburg his righteousness and explaining that Pannonia as a part of Elyria was under Rome’s jurisdiction. Methodius was released in the end of 873 or in the beginning of 874. In 874 he was already in Moravia where he settled down in Velegrad. His missionary work spread out in Czech and in Krakow, Poland which was partially subordinated by Svyatopolk. The results of his work were also fruitful in Slovakia and Carpathian Russia, Serbia and Slovenia. German bishops continued their intrigues against Methodius and had a support of insidious Svyatopolk. They had reported to Pope that Methodius was not preaching about the derivation of the Holy Spirit also from the Son as Catholic doctrine was teaching, did not recognize Pope’s authority and therefore was establishing church services in Slavonic. In 879 Pope asked Methodius to come to Rome. After listening to Methodius in front of the bishops Pope told Svyatopolk that "Moravian bishop" is recognized "an orthodox according to all churches’ teachings" and was returning him back to Moravia. At that time there was a German vicar bishop Wiching who was sent by Svyatopolk to town Nitra and who was not sympathetic to Methodius. After Methodius’s return to Moravia the situation was not easy there. There was an opposition of the prince, bishop Wiching and other Germans against him. Feeling the approach of death St Methodius increased the intensity of his work in translating books of Holy Bible (except a book of cannons), Nomakon, Paterikon (lives of sayings of some ancient ascetics), Reading of Hours, service book, some selected readings from New Testament, Parameinik, Chinyi tainstv and others. Archbishop Methodius went to Constantinople to visit tsar Vasily Macedonian in 882. At that time Photius was a patriarch again. Methodius died in Velegrad on the sixth of April in 885 after he had appointed his successor Gorazd Moravian who was highly respected by people. After Methodius’s death there were prosecutions against the disciples of St Methodius organized by Wiching and Svyatopolk. New Pope Stephan V was also an opponent to the righteous work. Unaware of St Methodius’s death the Pope was writing to Svyatopolk: "We are quite surprised that Methodius is under influence of a false teaching, not edification but hostility and not peace and if so his anti teaching is not accepted by us." His disciples Gorazd, Clement and Naum, suffered from the imprisonment and mockery; they were exhaled from Moravia together with other 200 priests in 886. During Svyatopolk’s grandson ruling the situation had improved in Moravia to some degree. Opposing to Germans at that time Pope John IX was seeking the support of Slavs. But in 907 Moravia did not exist any more after the split between Czechs and Hungarians. In Bulgaria the disciples of St Methodius were received with great joy. Tsar Boris was one of St Methodius’s students and his own baptism served as an example helping to spread out Christianity in his land. He asked Rome to send talented teachers of faith to Bulgaria in 886 due to the political reasons. But in 870 he finally joined eastern orthodoxy. Boris wished to have a national and independent from Byzantine church. The arrival of Methodius’ disciples was particularly important to him. They began an active enlightening work in Slavonic. Traveling through the whole country St Clement was preaching clearly the word of God to people and was explaining the commandments and dogmas. St Prince Boris secluded himself in a monastery in 893 where he died later. St Clement became a bishop during his second son Simeon’s reign who ruled by the will of his father. St Clement prepared bright people deserving to be ordained and he appointed countless priests, deacons, readers. Tsar Simeon became famous for terminating dependency on Tsar Grad in 907 and announced metropolitan Leontiy patriarch of Bulgarian church. That was the golden century of orthodox national culture in Bulgaria. Later it fell once again under the authority of Byzantine. As an enlightened orthodox country Bulgaria was of a big importance to Russia where Christianity was only establishing. Christianity spread out from Moravia to Bohemia (Czech). The marriage of Svyatopolk on the Bohemian princess had benefited to that. In 874 The Bohemian prince Borivoy and his wife Ludmila were baptized in Velgrad by St Methodius. The saint was laboring zealously in Czech at that time. The churches of St Clement and St Gregory were built in Prague. After Borivoy’s death in 894 there were two devoted to orthodoxy members of the dynasty in Czech, St Ludmila and her grandson St Vyacheslav. They both received a martyrdom death having condemned to dying by their relatives. St Vyacheslav was killed by his brother Boleslav, the head of a pagan party. He was trying to exterminate Christians until German Emperor Otton I forced him to stop violence. Christianity had triumphed during the reign of prince Boleslav II, The Pious but in Catholic interpretation. In 967 Catholic episcopacy was established in Prague. Dittmer was appointed as bishop who was Slav and knew Slavonic and Latin languages. People were fighting for Orthodoxy for a while. But after the defeat of Sazan tenement in 1097, the last bastion of Orthodoxy, this faith remained preserved only in rural areas. In ancient Poland there were times when the services were held in Slavonic and according to the eastern tradition. Polish prince Mechislav married a daughter of Boleslav I of Czech and was baptized. Later after that marriage on a catholic princess he accepted the authority of Pope. The Slavonic services were replaced by Latin. In 1025 that king exhaled orthodox priests and monks from Poland. It was especially important for future Russia that the deeds of St Cyril and Methodius were nailed down in the neighboring to it Bulgaria, passing to it its Orthodox Slavic culture. The ability of preaching to new Christians and confessing faith in understanding to them language enabled fast and faithful acceptance of Christ’s teaching by Russian people.